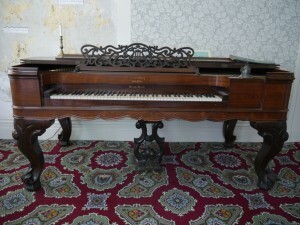 This rosewood Bradbury Square Grand Piano, on display in the Beall-Stibbs homestead, was likely built between 1854-1858. The square grand piano that sits in the Beall-Stibbs Homestead house in the southeast room on the first floor, which was the family parlor, was donated after the death of Emeline Stibbs McSweeney on November 5, 1958. Miss McSweeney’s Will stipulated that much of the Stibbs family furniture, the three oil portraits of General and Mrs. Beall, and of Joseph Stibbs, and the Bradbury Grand Scale Square Piano become the property of the Wayne County Historical Society and be placed in the museum. Her items were among the first donations to the new home of the historical society because she died four months after the Society had moved from the old Public Library to the Beall-Stibbs Homestead on E. Bowman street in 1958. Emeline McSweeney had been the last living area descendent of General Reasin Beall: being the great-great granddaughter of General Beall. Emeline S. McSweeney was born in the historic Beall-Stibbs Homestead house in 1874 and lived there until 1879. At the age of 4, Emeline S. McSweeney was stricken with Polio and never walked again without assistance. In 1880 her grandmother, Emeline B. Stibbs, built the house at 659 Beall Avenue (the house directly north of Drug Mart on the east side of Beall Ave.) on land that had formerly been a part of the General Beall estate. Emeline S. McSweeney, along with her parents, all moved in to the new house with grandmother Emeline B. Stibbs in 1880. Emeline S. McSweeney would live in the Beall Ave. house the rest of her life and held on to all the family heirlooms she had inherited over the years until they were donated to the Historical Society and once again sit in her family’s homestead. 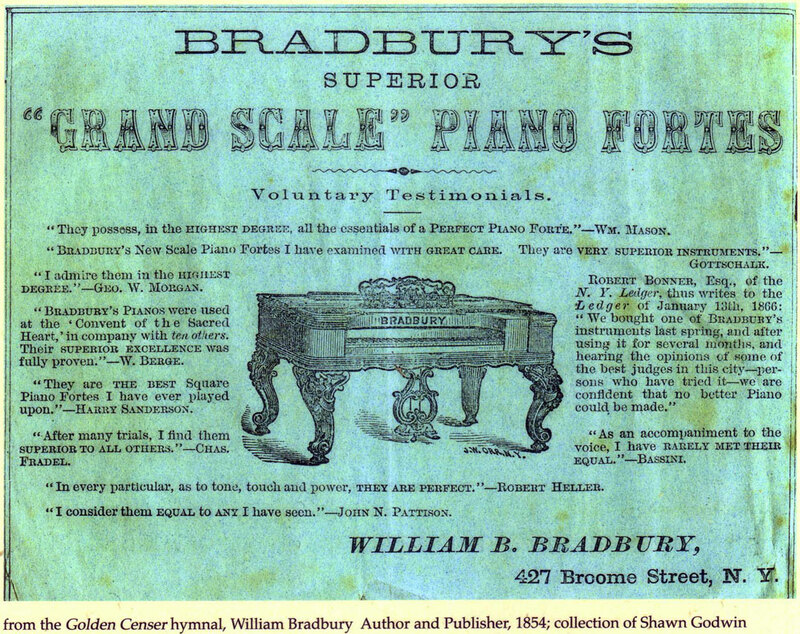 1854 Ad for the Bradbury Grand Scale Piano Forte. Courtesy of Shawn Godwin. The massive Square Grand Piano was made in a bold Rococo Revival style typical of the 1850s, with a Rosewood veneer, ivory & ebony keys, and was a very expensive piece of furniture. 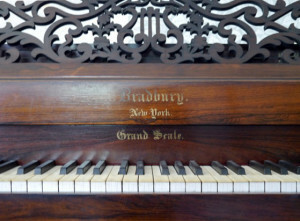 It was manufactured by the William Bradbury Piano Company of New York City. William Bradbury started out in partnership with the Lighte, Newton & Bradbury Piano Company in 1851. Two years later in 1853, Newton withdrew, and the business became known as Lighte & Bradbury. Then in 1861 that partnership was dissolved and William Bradbury independently formed the Bradbury Piano Company. William Bradbury died in 1867, and the Bradbury Piano Company was taken over by F. G. Smith. Under the guidance of F. G. Smith, the Bradbury Piano Company continued building excellent pianos for almost another 100 years, going out of business in about 1950. 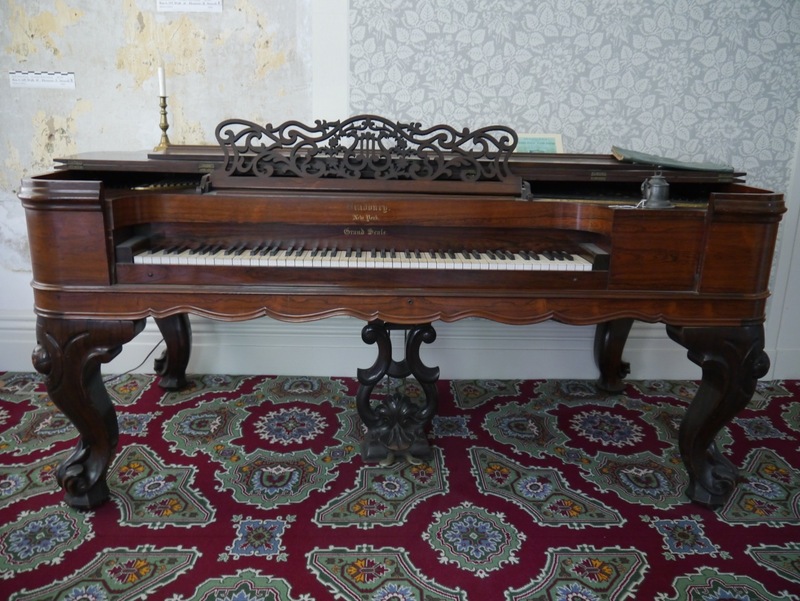 Beall-Stibbs family history shows the Square Grand Piano was shipped from New York City to Wooster, Ohio by rail and moved into the house sometime between 1854 and 1858 as it is frequently mentioned in the Stibbs’ family correspondence after 1858. The Stibbs’ family letters make it clear that the piano became the center of their family’s social life. All three of the Stibbs’ daughters took music lessons and spent many hours entertaining their parents, guests, and each other on this piano. It is a fun fact to note that other than the piano’s trip from New York in the 1850s, the piano has never been off the city block where it is currently located, although if one has ever moved it, one can see why— it is VERY heavy and would take an army of men to move it. The strings inside the Bradbury Square Grand Piano run left to right rather than front to back. For nearly 150 years, during the 18th and 19th Centuries, more Square Grand Pianos were built and sold in America and Europe than any other type of piano combined. Yet very few people living today have ever seen or heard of one. Sometimes this type of piano is also referred to as a Box Grand. The Square Grand Piano is an earlier version of the modern piano that was built in a rectangular shaped cabinet, sitting on four sturdy legs, with its strings running left to right, rather than front to back as they do in grand pianos of today. In the last part of the 18th Century, John Jacob Astor started importing Square Grand Pianos to America from Europe. By the turn of the 19th Century, a handful of makers are recorded as having made some of the first Square Grand Pianos in America. For the next 100 years, the Square Grand Piano would evolve into a larger, heavier, and more mechanically refined instrument. During the 19th Century, American Piano Makers built and sold more Square Grand Pianos than Grand Pianos or Upright Pianos. Vintage ephemera collections show these Square Grand Pianos selling for as much as $800 in the mid 19th Century which was the cost of a small house back then. By about 1880-1890, the American Upright Piano began to win favor as being more practical and fashionable than the Square Grand Piano. Because they were smaller and took up less floor space, the Upright Piano caused the Square Grand Piano to become obsolete by 1900 and all but extinct by today. Square Grand Pianos were very large and very heavy musical instruments. They were not easily moved. They were reminders of the gilded Victorian age, being very elaborate and ornate in style. As 20th Century America began to become a modern industrialized nation on the move, these beautiful old pianos quickly became out-dated and too big for the modern home. Sadly, for the past 100 years, Square Grand Pianos have been chopped-up, burned, or simply destroyed by neglect and lost forever. You might ask if Square Grand Pianos sound different than modern pianos? According to the folks at the Antique Piano Shop in eastern Tennessee they have found that to the untrained ear, the average person can tell very little difference in the tone of a restored Square Grand Piano compared to a typical new grand or upright piano. To understand why a Square Grand Piano sounds different than today’s modern instrument, one needs to understand a bit how music has evolved over the centuries. 300 years ago when the Piano was in its infancy, there was no such thing as electronic amplification. The Harpsichord and Clavichord were generally used in small intimate settings, producing adequate volume to fill an ordinary room but did not have the capability of producing loud or dynamic sound. They could only produce a steady soft tone. The early Piano-Forte had a decided advantage over its predecessors because it was able to produce both loud and soft dynamics, but not to the degree of modern instruments. These early Piano-Fortes had soft, leather covered hammers, and they produced an almost “harp like” quality that really is quite beautiful to hear. As the piano continued to evolve into the 19th Century, makers began to build their Pianos larger and heavier, ultimately allowing their strings to handle greater levels of tension. In Grand and Upright Pianos, hammers became covered with hard dense felt rather than the traditional softer leather covered hammers of their predecessors. As these instruments became larger and more evolved, they also became louder. 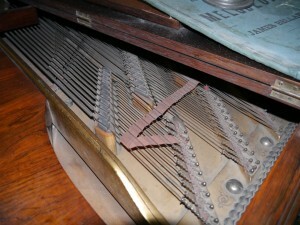 Higher tension, use of iron frames, and evolving science helped create the loud and powerful Piano that we know today. By the middle of the 19th Century, the traditional Grand Piano in America had evolved to a point where it sounded almost like the Pianos of today. There is evidence that much of 19th Century America did not like the loud and powerful sound of the evolving “Modern Piano” that was being introduced to them. Some described the tone as “harsh” and “overbearing”, and they preferred the softer, harp like tones of the earlier Piano-Forte that they were accustomed to. We believe that this the prime reason that the softer toned Square Grand Piano continued to be the most popular type of Piano built and sold up until the last part of the 19th Century. So yes, Square Grand Pianos do sound different than modern Pianos. When composers like Mozart, Chopin, Beethoven, and Schumann wrote their famous Nocturnes and Piano Concertos, they heard the music they wrote on early Piano-Fortes with delicate, beautiful tones. The Square Grand Piano continued to maintain this delicate tone quality throughout its entire existence, even as Grand and Upright Pianos became louder and harsher. More Square Grand Pianos were built and sold in the 19th Century than Upright or Grand pianos, indicating that 19th Century American preferred their tone quality to the more modern tone of the Grand and Upright Pianos. 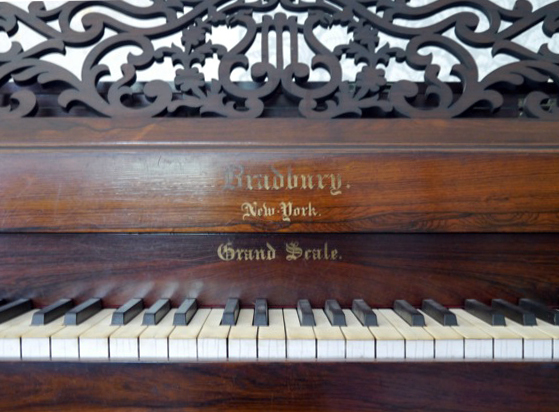 Next time you visit the Wayne County Historical Society be sure to take a look at the rare Bradbury Square Grand Piano in the Beall-Stibbs Homestead house. It is a beauty and it still sounds pretty good for a 160-year-old piano. I am very intrigued when I find a rare; one of a kind masterpiece. This piece of historical history is very interesting to me, I just might have to go down to the historical society and take a look at it.